Polynesian Dance Studio features real Polynesian dance and culture. You will get an authentic cultural experience. I am also director and instructor of Kinderhula and 'Ohana Arts Studio. We are based in Newport News, Virginia. I offer lessons, demonstrations, workshops, parties, and special events. Ha'aha'a (humility) is an important Hawaiian value to me. I offer my bio as a means to educate others about my background. Aloha. It gives me great honor to perpetuate my culture and to share my aloha. I was born and raised in Hawaii. My paternal Hawaiian roots come from Kaholokahiki and Kahunanui of rural Kaupo, Maui. My maternal Hawaiian roots come from the Among/ Keakuanui (means "great spirit") family from the Big Island of Hawaii. He Hawai'i ha'aheo au. I am proud to be Hawaiian. I am also Chinese, Caucasian, Morrocan, and Portuguese. I am proud of my heritage. I started dancing hula at age four. I also danced traditional Portuguese dancing for 2 years as a child. I also currently enjoy salsa dancing and belly dancing. My roots are from Hawaii. I am a real island girl. I continue to visit my island home and keep in touch with my family and friends. My oldest daughter, Makana, attends the University of Hawaii at Manoa. I was first taught hula by my mother who was a professional hula dancer from Hilo, Hawaii. I spent my summers in Keaukaha which is Hawaiian homestead land in Hilo. 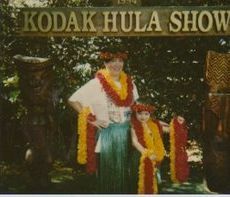 I was immersed in authentic Hawaiian culture there. Hula is my life. I also learned hula and other forms of Polynesian dancing from Lila Replinger. She was a professional hula dancer and musician. 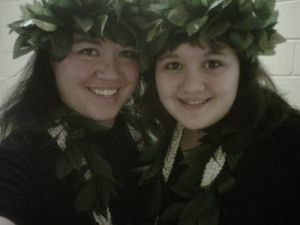 She chose me to become her student in the Hawaiian tradition and taught me hula. Then I continued my hula and cultural training throughout high school at Kamehameha which is a school for the education of Hawaiian children. I continue my studies today and regularly visit family and friends in Hawaii. I am your island connection. Aunty Lila was a member of the Waikiki Girls that sang with Al Kealoha Perry & his Singing Surfriders on the world famous "Hawaii Calls" radio show each Saturday. The Waikiki Girls included sisters Marion Kanekapolei Guerrero Diamond, Lila Kaualoku Guerrero Replinger, and their cousin, Eloise Gasper Holt. She was also one of the original hula dancers of the now defunct Kodak Hula Show of Waikiki. Lila's son is Rap Replinger who eventually became one of Hawaii's leading comedians. We are an 'ohana (family) based studio. All 5 of my children play ukulele and dance. I have taught all of my children how to Polynesian dance since they were 2 years old. Makanamaikalanimai ("my gift from the heavens" or "my gift from God") is 19, Mahinaokalani ("heavenly moon") is 15, Kamehanaokala ("warmth of the sun") is 12, Kekaimalu ("peaceful ocean") is 7, and Kealani ("heavenly white") is 5. My oldest 3 daughters are student teachers and performers. Hula is our legacy and we operate our studio family-style which is the Hawaiian way. My great-great-great grandfather is Augusto Dias. He is one of the three men who are credited for what is now known as the 'ukulele in the islands. He was also "among those who entertained King David Kalakaua in the royal bungalow on the grounds of Iolani Palace." My grandmother, Rose Lokelani Tam-Hoy, is known for her work in Hawaiian quilting. She is a member of Hale O Na Ali'i, the Daughters of Hawaii, the Ka'ahumanu Society, and the Chinese Women's Club. I assisted her with classes she offered at the Mission Houses Museum and at the Lanakila Senior Center. After graduating from Kamehameha in 1985, I attended the University of Hawaii at Manoa and then I moved to Seattle, Washington in 1986 to attend college. In 1997 I moved to Oklahoma due to my husband's career. From there we moved to Hampton, Virginia in 1998. I make my home in Newport News, Virginia and travel to the Baltimore/DC area regularly. - I worked in the tourist and airline industries in Hawaii. I was employed at Pleasant Hawaiian Holidays (now Pleasant Holidays) as a sales representative, stores in Waikiki, as a lei maker, for American Airlines, and then for Hawaiian Airlines. - I get re-certified in American Red Cross and First Aid each year and have done so since 1993. Learn hula from a real island girl!